The booklet versions of Heaven and If God Is Good have become standard usage for me when engaging in grief counseling with both those who are dying and those who have lost a loved one. While I occasionally give the full versions away, the mini ones are so convenient - people who are grieving are intrigued by their titles and appreciate the shorter read during all of the business that dealing with a death can bring. Thank you so much for these books! -J.S. I accidentally downloaded this book instead, thinking it was Randy Alcorn's larger book If God Is Good. However, I was delighted to find that this abbreviated version of Alcorn's Bible-based explanation of suffering and God's purposes in it to be immensely readable and faster paced than is the longer book mentioned above. I am currently going through a season of renewed suffering after a brief respite in the midst of many years of intractable pain...and frankly was struggling to accept God's purposes in allowing my suffering to be reintroduced in my life. I found comfort in this booklet as well as some chagrin that I had even questioned the purposes and wisdom of our amazing God. Randy is by no means pontificating or accusatory; rather, he sympathetically and gently approaches the topic with compassion, wisdom and with the evidence of much thought behind it. I could tell that this author is someone who has struggled both intellectually and experientially with the topic and problem of pain and has come up with answers grounded in Scripture that are at once satisfying, comforting and acceptable. 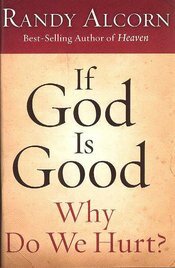 -Q.
I just finished reading your booklet, If God Is Good, Why Do We Hurt?, and it is excellent! Thank you for writing such a clear, objective and compassionate booklet to help others understand suffering. -T.C. In May I purchased 30 If God Is Good, Why Do We Hurt? booklets. I intended to give them to the graduating seniors at my church, but it was too late for the books to arrive in time. I decided to give them to the other youth leaders and some of my other friends, and then put the rest on our literature table in the foyer of the church. Last week one of the leaders told me that when on a cruise he had the booklet on the night stand by his bed in his room and the lady that took care of his room saw it and asked if she could read it. He told her she could not only read it, but she could have it. She was grateful and told him that she would also have her husband read it as well. What an amazing God we serve! I ordered and received another 40 of these booklets and will continue to pass them out, and as long as they continue to disappear from the table I will replace them. Thanks for a great tool for the kingdom. -W.F. Learn more about and purchase If God Is Good Why Do We Hurt? Booklet.